ALLOY STEEL – 4140 (641400) PER MIL-S-5626, 4340 (G43406) PER MIL-S-5000, OR 8740 (G87400) PER MIL-S-6049. TTTANIUM ALLOY – 6A1-6V-25n (R56620) PER AMS 4971. CRES – A-286 (S66286) PER AMS 5731 OR AMS 5737 EXCEPT HEAT TREAT TO 180 KSI MIN. CORROSION RESISTANT STEEL – 180 KSI MIN ULT TENSILE; 108 KSI MIN ULT SHEAR AT ROOM TEMPERATURE. ALLOY STEEL – CADMIUM PLATE PER QQ-P-416, TYPE II, CLASS 2, BOLTS, ARE NOT TO BEPICKLED. IMMEDIATELY AFTER PLATING (WITHIN 1 HOUR) BAKE AT 375F +-25F FOR A MINIMUM OF 23 HOURS. CORROSION RESISTANT STEEL – CLEAN AND PASSIVATE PER QQ-P-35. CORROSION RESISTANT STEEL AND TITANIUM ALLOY – OPTIONAL ALUMINUM COAT PER NAS4006, DESIGNATED BY CODE “P”. INCLUDE A HALOGEN FREE CETYL ALCOHOL LUBRICANT ON ALL TITANIUM BOLTS. NO LETTER CODE – BOLT, ALLOY STEEL, UNDRILLED. ADD “D” TO DASH NUMBER FOR DRILLED SHANK. ADD “H” TO DASH NUMBER FOR DRILLED HEAD. ADD “P” TO DASH NUMBER ON CRES AND TITANIUM BOLTS FOR ALUMINUM COAT. ADD “T” IN LIEU OF DASH DESIGNATES TITANIUM ALLOY (FORMER “V” CODE). ADD “C” IN LIEU OF DASH DESIGNATES CORROSION RESISTANT STEEL. RESTRICTED USE: FOR REPAIR WORK ONLY. 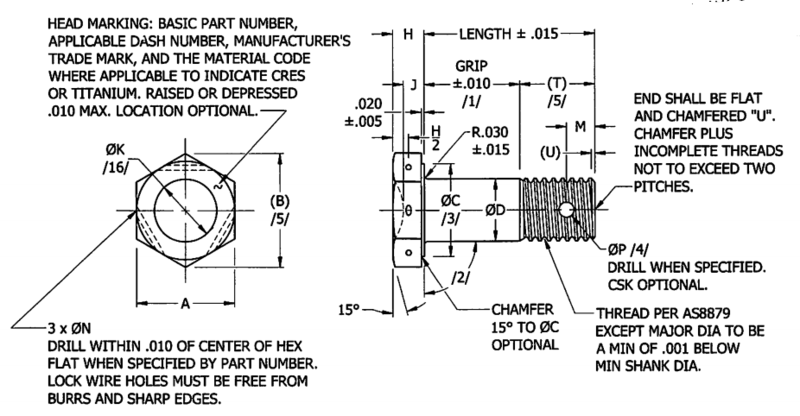 .0156 and 0.312 OVERSIZE SHANK FOR REPLACEMENT OF BOLTS SHOWN ON SHEET 1.